It is a perfect summers day and you are enjoying a delicious ice cream as you sit by the pool. As you look down, you see your dog staring up at you with those eyes. Damn it those eyes! They get you every time. If only you had a dog-friendly ice cream that you could treat your pooch with. Well, guess what, stop searching now because I have found it for you! The Best Dog Ice Cream in town. I sure do love ice cream and since going gluten, corn and soy free, due to my health issues, I hardly ever have ice cream. Often when I am not eating things myself, I don’t seek them out for my dog. But, I had always wondered about feeding a dog-friendly ice cream. Especially as I use a lot of coconut based products myself - coconut flour, coconut oil, coconut milk, desiccated coconut. Perhaps I am coconut crazy! So I was pretty excited when we first discovered the amazing Hugo’s Ice Creamery at, yes you guessed it, Chew Chomp and Chill. I was amazed by the product. The portion size was perfect, it smelt amazing and it had animal-friendly ingredients. 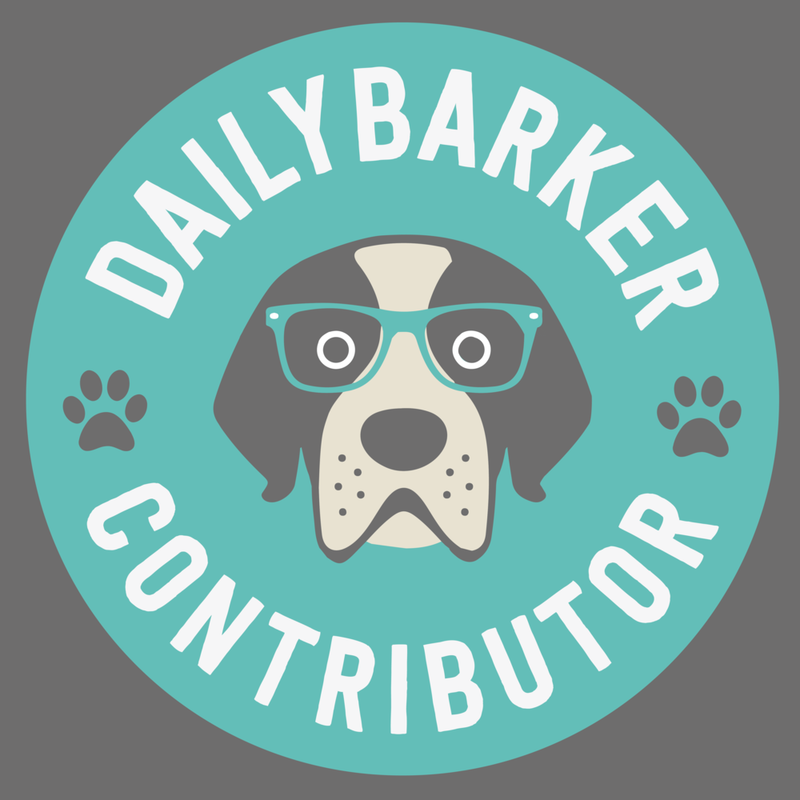 Is Ice Cream Bad for Dogs? The stock standard ice cream that you find at the supermarkets is filled with sugar and other nasty ingredients that dogs really should not be eating. I myself do not eat much dairy but if I buy an ice cream these are the ingredients I am looking for - milk/cream, egg whites, sugar, +/- vanilla and then some flavour. Simple! But again, please remember that a lot of my health choices that I make for myself, my husband and Amos are based on my health challenges and my experiences so they are very much my opinions. But even if you do get the best and fanciest ice cream, let's also remember that majority of dogs can’t tolerate lactose. Hugo’s Ice Creamery makes their ice cream with coconut milk and is sweetened with organic agave nectar. Additional ingredients are then added depending on the flavour. All ingredients are 100% natural and approved by a pet nutritionist. But also, just because it is good for them let's be sensible guys, as with anything do not overfeed. As well as being lactose-free, there are numerous health benefits to eating coconut milk. 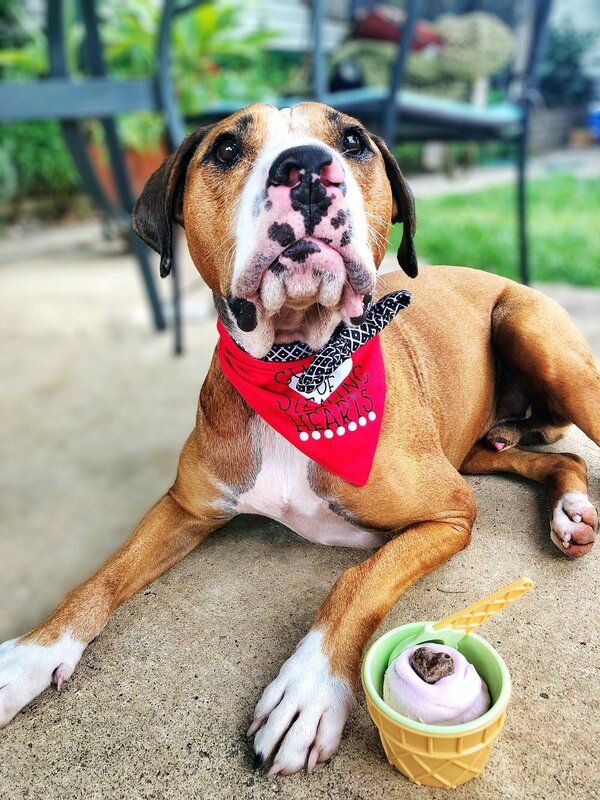 Just a dog with a cool nose enjoying a delicious dog friendly ice cream. Could life get any better? Whenever I find a brand or product that I really like, I try to get to know the owner so that I can see what they are all about. Right from the go I knew i liked Hugo’s and I wanted to get to know them more. One of the things I want to do with my blog is to allow you to get to know the faces behind the companies that I love. It really feels more personal and gives you an insight into just why they started the business and why they are so passionate about it. So, let's go meet Jenna the face behind Hugo’s! Amos and Jenna , Amos is feeling pretty cool in his Denim Jacket. I asked Jenna the following 4 questions and she gave me some pretty good answers! 1. Why did you start this business? I’m a self-confessed crazy dog lady, and have run Doggie Tea and Paws at the Park for the last few years. The original couple who started Hugo’s approached me to let me know they were looking for someone to take over the business and I jumped at the chance! I’ve had so much fun growing Hugo’s from 20 to over 65 stockists - it’s such a fun product and it’s amazing to see so many beautiful dogs enjoy it! I have especially loved creating the special edition flavours for Christmas, Valentine’s Day and Easter and have more planned for the year. Aussie dogs deserve to enjoy ice cream just like us - and I love making it for them! 2. How many dogs do you have? Just one rescue dog Ruby, we found her on Pet Rescue after she was taken from a pretty awful backyard situation. She’s a pretty anxious dog, but the most loving and beautiful dog. 3. Why did you get a dog? I’ve wanted a furry family member for as long as I could remember! It wasn’t until we finally had a home with enough space that we began the search. We love scruffy dogs, and Ruby’s wiry fur and awkwardness made us fall in love with her. 4. Describe yourself in 3 words. And guess what!! Jenna's first job was actually scooping ice cream at Dezina Scoop in Burleigh! She was clearly destined for a lifelong career in ice cream! I sure hope you enjoyed getting to know a bit more information on Jenna! We sure did. Choosing is so hard especially when you have to sit there in front of all 3 without eating! Yes, my friends, there is not just 1 flavour but 3, PLUS special edition flavours throughout the year! I am sure you have all seen the “I Woof You” for Valentines Day and “Egg-cellent” for Easter. I can’t wait to find out what more there shall be this coming year. So let's talk about the flavours and remember, they are all made using coconut milk. Made with real peanut butter and chunks of crispy coconut bacon - yes it sounds heavenly! Made with strawberries, strawberry extract and beetroot for the colour. Made with carob, a dog safe chocolatey goodness! Not sure what Carob is? Carob is entirely different to cocoa power and is non toxic to dogs and in fact, it's actually pretty good for them. Carob is extracted from the carob bean and contains a variety of healthy nutrients and fibre for dogs. For a full list of stockists, click here. It is not just me who adores Hugo’s Ice Creamery but a lot of our Instagram friends do too! Beau is a 1 year old handsome Dalmatian and is the biggest, happiest goofball! He loves his food and the best treat to have on a warm day is Hugo’s Icecream of course. His favourite flavour would have to be Strawberry, but he’s certainly not fussy and would eat any flavour that was put in front of him. Charli is an almost 2 year old chocolate Labrador. Her favourite places are the beach and snuggling up in bed. Oliver is the five month old half brother of Charli. He is obsessed with food and enjoys meeting everyone! Oliver loves playing with his sister and sleeping in the sandpit. Luna is a 17 month old Labrador cross with a massive heart. She is the sweetest and most affectionate pup and will never shy from giving you a big sloppy kiss. Food is Luna’s kryptonite, so it’s no surprise at all that she absolutely LOVES Hugo’s ice cream. There is no flavour she will turn away, and she will lick the bowl until every last drop is gone! And the best part is that all the ingredients are 100% natural & 100% DELICIOUS. Odie is a 20-month-old Alaskan Malamute living in Brisbane. He loves to spend time exploring the city visiting cafes and pet stores with Mum and Dad, but only if there is Hugo’s involved! 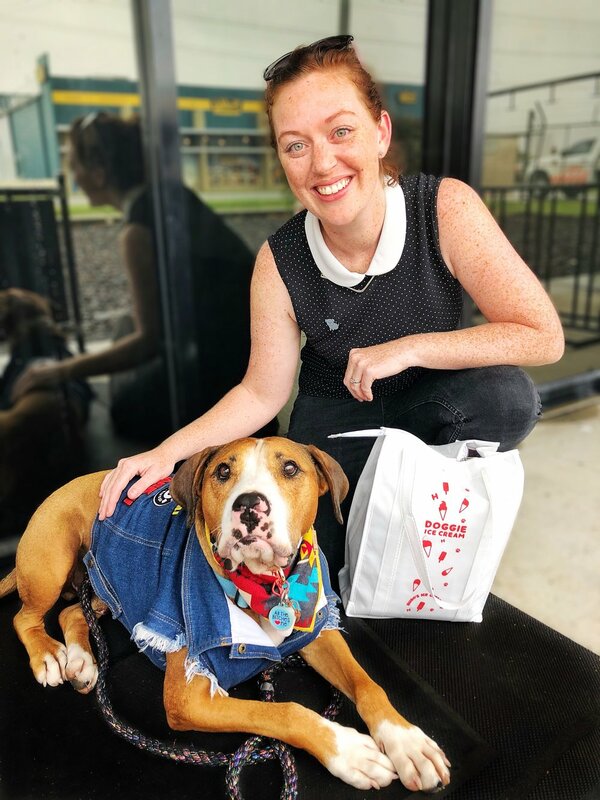 We love how they are a local company that uses dog-friendly ingredients so everyone can enjoy an ice cream on a hot day. I can not believe just how lucky we are to have found the best dog ice cream in town right here in Brisbane. You really have got to try it if you have not already. Knowing that it is not only safe but healthy for your dogs, is a huge selling point for us. We love Jenna's passion for the business and her commitment to dog health. We really hope that you enjoyed reading all about Hugo's Ice Creamery and that you learnt something that you did not know already. Please help us educate more dog owners and lovers about Dog Friendly ice cream and share this on your social media accounts. Thank you so much for reading my friends! Be sure to drop us a comment below if you too love Ice Cream!!! Have you got one of our "Adopt Don't Shop" Hats yet?! Use #imwithamos on your post! Can't wait to see you all rocking them. Loving my life after rescue and educating others on the joys of owning a rescue dog.